Private wind energy development, oil and gas regulations and preservation of the state’s waterways topped the list of issues considered this session by the Legislature’s Natural Resources Committee. LB824, introduced by Omaha Sen. John McCollister, exempts private renewable energy generation facilities—including wind farms—from certain laws that currently regulate facilities generating electricity. The bill, passed 34-10, eliminates the requirement that a developer have a power purchase agreement, in which a customer agrees to buy most of a proposed facility’s electricity, before the facility is built. The bill also exempts a private developer from a requirement that it prove that a new facility would not create stranded assets. 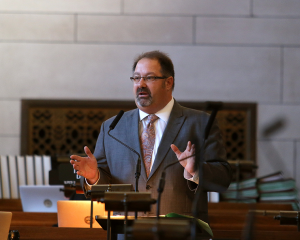 The bill contains provisions from LB914, introduced by Sen. Ken Schilz of Ogallala, that increase from $60 to $250 per day the compensation for the Nebraska Power Review Board member who represents the state on the Southwest Power Pool’s regional state committee. An appropriation of $19,000 in fiscal year 2016-17 and again in FY2017-18 is provided to the board to cover the cost. Schilz also introduced LB1082, passed 48-0, which enhances disclosure and public notice regulations on wells used to dispose of wastewater generated by oil and gas operations, including hydraulic fracturing, commonly called fracking. The bill requires commercial injection well operators to sample and analyze injected wastewater at least once per year and provide the resulting data to the Oil and Gas Conservation Commission, which regulates Nebraska’s oil and gas production. The bill also requires the certification and monitoring of vehicles used to transport the wastewater and the periodic evaluation of an operator’s ability to pay the costs of shutting down a well. The commission is required to provide public notice of an injection well permit application to the county, city or village where the well would be located and could conduct public meetings to review them. A bill that would have required liability insurance for injection and disposal wells was held in committee. Under LB1070, introduced by Sen. Ken Haar of Malcolm, the Nebraska Oil and Gas Conservation Commission would have required proof of liability insurance of at least $1 million before issuing a permit for the drilling of an injection or recovery well. A commercial disposal facility that disposes of more than 500 barrels of injection well wastewater a day would have been required to have at least $5 million in liability insurance. The bill also would have prohibited injection wells in areas where the drinking water aquifer begins less than 50 feet below ground or if the saturated depth of the aquifer extends more than 100 feet below ground. LB897, introduced by Omaha Sen. Brett Lindstrom, authorizes any power-generating agency that operates in a regional transmission organization to participate in hedging transactions for fuel, power or energy. The agency could use no more than 5 percent of its annual gross revenue averaged over the previous three years for the transactions. It could use only funds designated for the investments—not facilities or other assets—and the agency’s governing body must authorize any hedging agreement. Sen. Al Davis of Hyannis introduced LB1038, which allows a water appropriation used to generate hydropower at a facility on a natural stream to be changed to an instream basin management appropriation to be held jointly by the state Game and Parks Commission and at least one natural resources district. That appropriation would be used to maintain stream flow for fish, wildlife and recreation. The bill incorporates provisions from LB711, introduced by Sen. Dan Hughes of Venango, that reestablish a task force with the goal of eradicating invasive plant species that reduce stream flows. The task force will be allocated $1 million per year beginning in FY2016-17. Further, the bill requires the state Department of Roads to provide permits to trim vegetation that obscures lawfully placed advertising signs or displays. Sen. Curt Friesen of Henderson introduced LB737, which expands the eligible funded activities for public entities seeking loans from the Clean Water State Revolving Fund. The fund provides low-interest loans and community matching grants to towns and cities for the construction of wastewater treatment facilities and sanitary sewer collection systems. The purchase of land used for construction of water treatment facilities is now eligible for the loans, as are projects that conserve or reuse water. This includes the recycling or reuse of storm water, wastewater and subsurface drainage water, as well as the development and construction of watershed projects. The bill increases the fund’s loan terms from the current 20 years to a maximum of 30 years, or the projected life of the project, whichever is less. A bill authorizing natural resources districts to use bonds to pay for water management projects stalled on general file. Introduced by Sen. Rick Kolowski of Omaha, LB344 would have authorized natural resources districts to issue general obligation bonds to pay for water management projects provided that two-thirds of the district’s board of directors approve. The bonds would have been retired using the district’s tax revenue. After several hours of debate, Kolowski filed a motion to bracket the bill until April 20, the last day of the session. Senators obliged without objection, ending consideration of the bill. A bill that would have added local beneficial use programs to the existing exemptions for nonuse of a water appropriation did not advance from committee. LB714, introduced by Sen. John Stinner of Gering, would have expanded the circumstances under which a surface water appropriation could go unused for its originally intended purpose without the appropriation being cancelled by the state Department of Natural Resources. Under the bill, a landowner could have transferred his or her water appropriation to a natural resources district for up to 15 years for use in aquifer recharge, depletion offsets, maintenance of instream flows and stream augmentation. The bill also would have allowed the water to be used for up to 15 years by local programs that manage waterways. McCollister introduced LB745, passed 45-3, which raises fees that the state Game and Parks Commission is authorized to charge for a wide range of permits, licenses and stamps. It also raises the caps on user fee ranges and increases the allowed growth rate for fees the commission is authorized to charge for hunting, fishing and other activities. The fee increases will generate an estimated $2.5 million in FY2016-17 and a further $5 million in FY2017-18. Resident fee caps for an annual hunting permit will be raised from $13 to $18 and the cap on an annual fishing permit will increase from $17.50 to $24. The bill will raise the fee cap for a deer hunting permit for residents from $29 to $39. The minimum fee for an annual park permit for a resident motor vehicle will increase from $25 to $30. LB961, introduced by Omaha Sen. Ernie Chambers, would have ended the state Game and Parks Commission’s authority to establish a hunting season for mountain lions. The bill was indefinitely postponed by the committee on a 6-0 vote. Omaha Sen. Heath Mello introduced LB1101, passed 47-0, which directs the state Department of Environmental Quality (DEQ) to conduct a study examining the status of the recycling and solid waste management programs operated by the department. The DEQ will study the efficacy of current litter, waste reduction and recycling programs and conduct a needs assessment with regard to recycling and composting programs in the state. Potential funding sources, including public-private partnerships, also will be included in the study. LB1101 authorizes the DEQ to create an advisory committee comprising no more than nine people. The committee will provide a report of its findings to the Legislature by Dec. 15, 2017.